Flattened, originally uploaded by mike1727. The veg project was going well until the inevitable bank holiday downpour wreaked havoc. 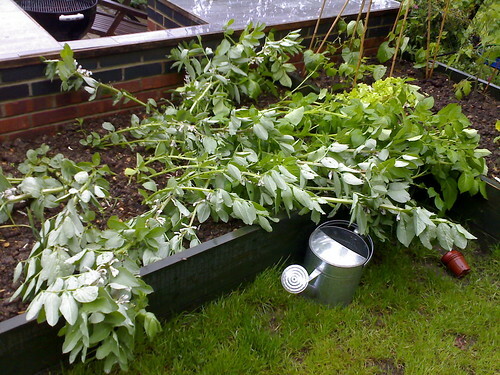 Beans were the main victims- broads flattened to the ground, runners and French were battered by the rain and hail, lost leaves and had a couple of broken growing tips. A bit of time with string and cane should've saved the broads, and with luck the runners and French will re-grow some more stems. I need to plant up a tepee of runner/s French for a second crop anyway The outdoor tomatoes took a hit too, but tied in they seem OK. Elsewhere in the veg project, the lettuce is going well and is producing enough leaves for tasty salads. Spring onions are just about OK but not really growing as strongly as I'd hoped. There's another gutterfull germinating in the greenhouse waiting for planting out in a sunnier location, assuming I can find some space. The first sowing of spinach has been similarly disappointing so there's another gutter of that under way. The courgette plants are in, and I planted a couple of spare cucumber plants in the bed to see how they fare- better than chucking them on the compost. Also crowding into the second bed are a couple of butternut squashes which I'm hoping to grow up stakes: the idea is to have courgettes and cucumbers rambling at ground level to block out weeds while the beans, squashes and tomatoes work vertically. I've a feeling this bed is too crowded, but only summer will tell. In the greenhouse, I'm beginning to regret planting so many tomatoes..I've planted up the ones I want to grow and the remaining dozen or so plants are either being given away tomorrow or going on the compost. Chillis and aubergines are growing well and will be in growbags soon. Spuds seem to be doing well, though I'm not sure they are meant to have such rampant foliage- possibly a result of growing them in compost? 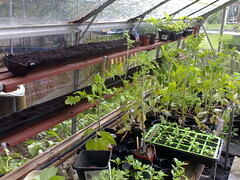 Sowed recently: in the greenhouse; spring onion, spinach and cabbage in gutters. Outdoors- country cottage mixed flowers in gaps in the beds, (which have germinated OK) and cornflower (which haven't). Planted out: 2 courgettes, 2 butternut squash, black Geranium, Cosmos, a Day Lilly-like plant which I can't remember the name of, loads of Nasturtiums.